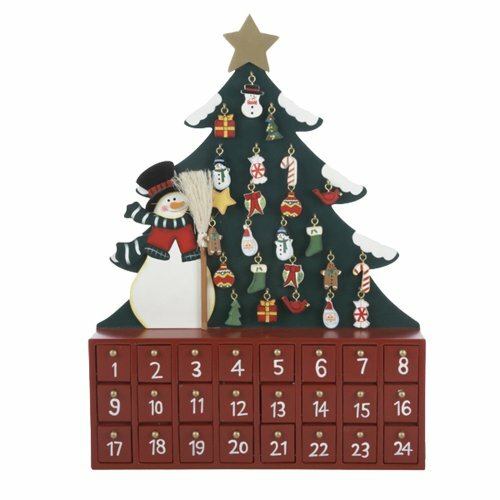 This Kurt Adler Wooden Snowman with Tree Advent Calendar is a fun, festive way to count down the days throughout Advent until Christmas Day! This large green Christmas tree has 24 small golden hooks on which to hang 24 tiny, detailed ornaments, including candy, trees, stockings, wreaths, snowmen, and birds. Standing next to the tree is a snowman wearing a black top hat, and green and white striped scarf, a red and green coat, and is holding an actual bristled broom. The base that is holding the snowman and tree is a large red chest with 24 numbered doors--one for each of the tree ornaments, so that each day in Advent, a new door can be opened to reveal a new ornament to hang!